IMPORTANT: This software is only for use with the products identified and sold in Australia and New Zealand. Not all models are sold in all countries. Thank you for your continued interest in Sony products. Sony is always concern about quality and customer satisfaction and therefore is offering a firmware update for FM/AM Clock Radio ICF-CL75iP. To update the firmware, follow the procedure below. * To confirm the firmware version of the unit, please refer to below. System may freeze periodically (approximately 25days). This system freeze causes some incorrect display (Clock stall, Black out) and key operation may not be accepted. Clock Display Mode changes to the primary setting (Big Clock) if the alarm is allowed to sound until it automatically stopped (one hour from the alarm start time). Display brightness changes to the primary setting (High) when AC power is turned OFF and then ON. Under certain circumstance, the alarm may not sound at the time set. ICF-CL75iP will recognize iPod Touch 4th Generation (iOS4). When setting AM Radio as Alarm Sound of Alarm B, AM Radio is not tuned properly. When Spanish(Español) is selected as language, Alarm Date(Fecha) is indicated inversely on the clock screen. After turning on the unit and the screen is displayed, press the HOME button. Select General Settings and press the ENTER button. Select Unit information and press the ENTER button. Check S/W Version. If 1.00, 1.01, 1.02, 1.03, 1.04, 1.05 or 1.06 is listed, proceed with the firmware update. 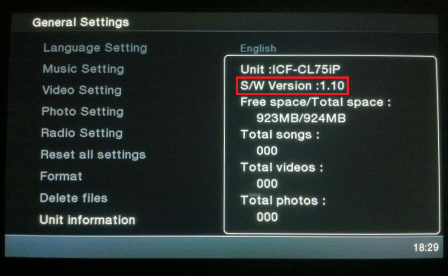 If the firmware version of the unit is already 1.07, there is no need to apply this firmware update. NOTE: USB memory / MEMORY STICK™ / MultiMedia Card™ cannot be used. A "User Account Control" dialogue when using Windows® 7/Windows Vista® or a "Security Warning" dialogue when using Windows® XP may be displayed. In such cases, please continue the installation when you agree to the on-screen message. Download the file. When you click the Download button, the downloading of the file starts. Extracting the file you have downloaded. 1) Right-click the file "ICF_CL75IP_V110_U.zip" which you have saved on your computer. 3) Click Extract when the window "Extract Compressed (Zipped) Folders" is displayed. 4) The folder "ICF_CL75IP_V110_U" is open on your computer desktop and it is displayed. 3) Click Next when "Extraction Wizard" is displayed. 6) The folder "ICF_CL75IP_V110_U" is open on computer desktop and is displayed. 2) The folder "ICF_CL75IP_V110_U" is created on computer desktop. There are 20 files in the extracted folder "ICF_CL75IP_V110_U"
Prepare a SD™ MEMORY CARD which you have just initialized (formatted). Copy the extracted files to a SD™ MEMORY CARD. 1) Insert the initialized (formatted) SD™ MEMORY CARD into the SD memory card slot on your computer. 2) Open the folder "ICF_CL75IP_V110_U" on your desktop, and copy all of 20 files into the SD™ MEMORY CARD. 1) Disconnect the AC power cord (mains lead) from the wall outlet, and insert the SD™ MEMORY CARD firmly into the slot. 2) Plug the AC power cord (mains lead) into a wall outlet. 3) Select Yes with Preset + /- and press the ENTER button. 4) Firmware update starts, and the confirmation screen appears in about 1 minute. 5) Remove the SD™ MEMORY CARD from the slot and press the ENTER button. 6) When the normal screen launches, press the HOME button. 7) Select General Settings and press the ENTER button. 8) Select Unit information and press the ENTER button. Check that S/W Version is 1.10. If firmware updating procedure was not completed successfully or the Clock Radio ICF-CL75iP cannot be turn on, please consult your local authorized Sony service facility.